Naturally, the bride and her wedding gown are going to get most of the time and attention when planning a wedding. For many families, however, the flower girl’s dress is nearly as important. The flower girl has an important role in walking down the aisle just prior to the bride, and like the bride herself, will have all eyes on her. Most little girls love being the center of attention for that moment, especially if they look great in their beautiful flower girl dress. 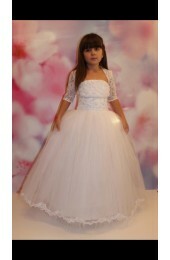 We have a large selection of cute dresses for young ladies of all ages. Whether your flower girl is barely old enough to walk, or is a growing young lady, we have something that will look perfect on them. Some brides like to have the flower girl wear a dress that looks similar to the bridal gown, which is a lovely idea and something we can help you to accomplish. Others like the dress to be completely different, and that is fine too. Little girls come in all shapes and sizes so the dresses will likely need to be altered at least a little bit to ensure it fits properly. We can do this type of alteration right in our boutique. We can alter the dress when you buy it, or wait until the date of the wedding gets a little closer to avoid the risk of the flower girl having a growth spurt. Of course, if that does happen, we can quickly perform the last minute alterations to help ensure the dress is perfect for your big day. If you have a flower girl that is a little nervous about her job in the wedding, it can help to have them play an active role in choosing the flower girl dress. Letting her see all the options and find one that she loves can help turn those nerves into excitement. Most young ladies only want to try on a few dresses before they pick on that they like, but even if they would like to try on many more, we are here to help them every step of the way. Just like the brides, we want to serve you and your flower girl with the best possible service. Of course, we will always take our instructions from the parents when bringing out dresses to ensure we only show dresses that are approved for the young lady and within your budget. Just let our experienced sales professionals know what you’re interested in and we’ll help ensure everything goes smoothly. 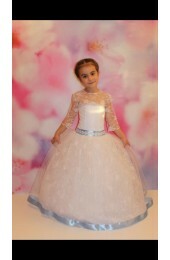 We serve people throughout Brooklyn and Gravesend with beautiful flower girl dresses and other services. If you have any questions or would like to see some dresses, please don’t hesitate to stop in our shop anytime. We are located at 1110 Ave U Brooklyn, NY 11223. You can also call us at 347-462-4941 to speak with one of our customer service professionals. Crystal Bridal Boutique is one of the best unique Elegant European wedding gown retailers. Our gowns are magnificently crafted from the highest quality fabrics and stunningly accented with beautiful hand detailing and embroidery. The unsurpassed luxury of our dresses reaches and gains any heart without having left any bride indifferent. *** For an additional Hours of Operation please contact the Store !! !